Press for the reunited Graham Parker & The Rumour tour (and album) focuses much attention and credit on the band’s appearance in Judd Apatow‘s upcoming movie, This Is 40. I’m sure that played a small part, but longtime members of the Halls of Rock know this 2010 interview with Rumour guitarist Martin Belmont is the main reason the band is back together and playing at Philadelphia’s Theater of the Living Arts tonight. OK, our interview is a distant second to the documentary Belmont discusses in the following interview, but let’s give ourselves credit ahead of Apatow. Next thing you know the Farrelly brothers will be taking credit for exposing Jonathan Richman to a mainstream audience. Go Graham! Go Martin! Go Rumour! I will be at tonight’s show with bells on. This post initially appeared 3/19/10. The guitar playing of Martin Belmont has graced recordings and concerts by Graham Parker & The Rumour, Ducks Deluxe, Nick Lowe, Carlene Carter, Johnny Cash, Elvis Costello, and many more. He continues to keep a busy schedule, playing the music he loves with a reunited Ducks as well as three other Americana-oriented British artists. In 2009 Belmont released The Guest List, a collection of covers sung by most of the singers he’s backed for a significant time over the years. For someone like myself, who grew up listening to Belmont’s work in the 1970s and 1980s, it’s an intimate, low-key way of catching up with the old gang and getting introduced to some Belmont collaborators who are not as well known in the States. I describe my experiences finding out about Graham Parker & The Rumour as a teenager, trying not to come off too much like Chris Farley’s mouth-breathing Paul McCartney fan from Saturday Night Live. Belmont asks if I’ve seen Parker perform solo in recent years – I have. He raves about his old friend’s abilities as a performer and songwriter, and then we get down to talking. And talk we did. There are a topics we didn’t have time to cover, but as we chatted, rock lover to rock lover, I hope you get a sense of Belmont’s ultimate sideman’s dedication, warmth, and regard toward his collaborators. At one point he talks about the importance of the guitarist serving the song and being able to weave into whatever situation the song and its musicians requires. It was clear to me that these abilities to weave extend well beyond Belmont’s fretboard. The patented Rock Town Hall Dugout Chatter segment that concludes this interview is presented in audio form. Through my space-age, retro technology for recording this interview, I hope the audio Chatter gives you an added sense of Martin’s enthusiasm and passion for rock ‘n roll. Take it away, Martin! 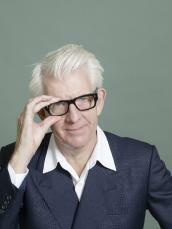 Nick Lowe with Mr. Moderator. 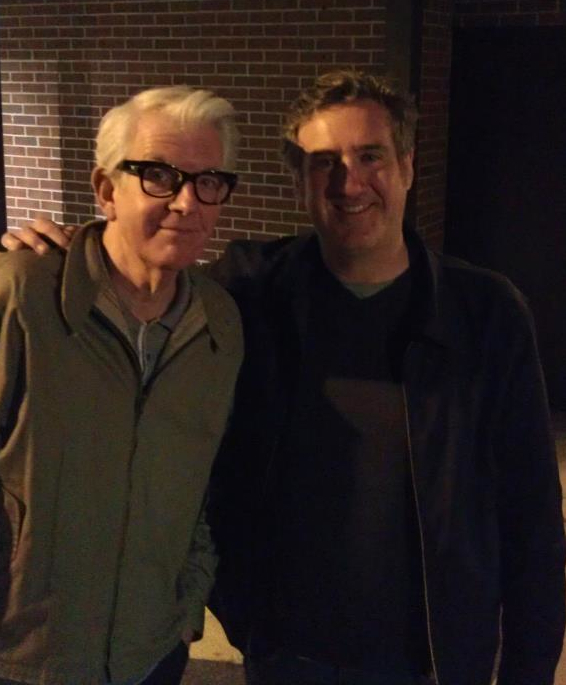 I’ll share some thoughts on seeing Nick Lowe and his band at the Keswick Theatre, in Glenside, Pennsylvania, outside Philadelphia and a stone’s throw away from where I spent 12 years in lower, middle, and upper school, sometime later, when I can catch my breath. Mad props! to Philly music and film writer extraordinaire Sam Adams for providing me this opportunity. The recent rifts over Billy Joel had me yearning for something that we all could agree on. I stumbled across this series of videos from an episode of Eight Days A Week, a British music talk show. Not only did it offer a well-spoken and coifed Green Gartside, a grey but tactful Nick Lowe, and rock critic/pseudo groupie Janice Long, but the discussion covered such a wide assortment of musicians circa 1984 that it seemed that we all could find something to love. In part 1, we have the conundrum of a whether a member of Culture Club‘s solo attempt is any good. We move along to some footage of The Clash at Shea Stadium and discussion of the jettison of Mick Jones. In part 2, we have fun the Liverpudlian way, with Echo and the Bunnymen. And in part 3, we hear about Pogue Mahone and other pub bands of the time. Along the way, we are also treated to references to Neil Diamond, Elvis Costello, The Moody Blues, and the latest band to jump the pond, REM. Parts 2 and 3 follow after the jump! One of the hazards with any of KingEd‘s Insta-Reviews is the chance that his gut feelings on a new release will not hold over time. Although Rock Town Hall stands behind even the most bile-filled reviews of our self-appointed King of New Music Reviews, we reserve the right—and believe we owe it to our readers—to occaisionally revisit one of his pieces, such as his recent review of Nick Lowe‘s latest album, and offer consumers a more balanced, clear-headed review that will better reflect the refined tastes of our readers and advertisers. In that spirit, I have taken the past week to let Nick Lowe’s The Old Magic sink in over repeated listens. I hope my review will stand as an alternate point of view for consumers’ consideration. Up to this point, Nick Lowe’s “mature” solo career has been an incidental affair, something that has surfaced in the interludes between public radio interviews and photo shoots. His previous releases — 1998’s Dig My Mood, 2001’s The Convincer, and 2007’s At My Age — were earnest, respectable efforts that offered their fair share of pleasures but did not establish a distinct or significant new musical identity for Lowe apart from his Jesus of Cool persona. The Old Magic finds Lowe taking a giant step — not away from the shadow of his Rockpile-era works but beyond what that understandably history-bound artist has been able to achieve on record in recent times. This is terrible, this may be the worst attitude I’ve had about a new release in years. It’s been 2 weeks since I purchased Nick Lowe‘s new album, The Old Magic. I’ve yet to spin it. As anyone who knows me and my Insta-Reviews can tell you, “KingEd don’t sit on new releases for 2 weeks.” OK, I sat on a pile of Robert Pollard-related releases sent to me by Townsman kpdexter for too long, but that was because life was crazy busy, not because I had a bad attitude about listening to Pollards then-latest 19 albums. Mention of Jim Ford and Joe South recently reminded me that I’ve been meaning to write something about Dallas Frazier, who is another one of those artists who was adept at blending country and soul. Frazier is the man who wrote “Mohair Sam,” which was a big hit for Charlie Rich. He looks so uncomfortable there, but here is singing it again during his ’70s phase. He was one of the biggest stars in Nashville at that time, and he’s gotten much less stage-shy. Nice shirt.